In her update on the official ℃-ute blog titled “Today is~~ “, fellow ℃-ute member Hagiwara Mai shared a picture of Maimi, ℃-ute, and Buono! 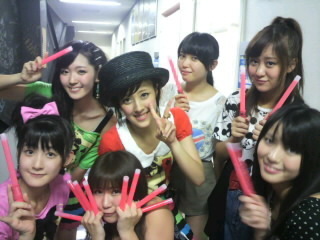 from backstage at Buono!’s live today, which was posted again in Airi’s entry, and then Chisato’s. Full translations of the members’ blogs can be found at blog!project. Posted on August 27, 2011, in Articles and tagged Yajima Maimi. Bookmark the permalink. 3 Comments. lovely picture I must say…..